CULTURE MINISTER Mary Hanafin has welcomed the announcement by Bank of Ireland that it will done twelve artworks of ‘national importance’ to the Irish Museum of Modern Art (IMMA), withdrawing them from an auction scheduled later this month. The bank was set to offload the majority of its art collection in an effort to raise cash and minimise any future requirement for the state to provide it with emergency capital, with the auction scheduled for November 24. The art, which had been displayed at various branches and in head offices around the country, will now instead be displayed at IMMA’s premises at Kilmainham for public viewing. Hanafin said that the twelve workers earmarked for donation had been chosen by IMMA as being “significant additions to the collection and will greatly enhance the collections that will be available for public viewing and future exhibitions. 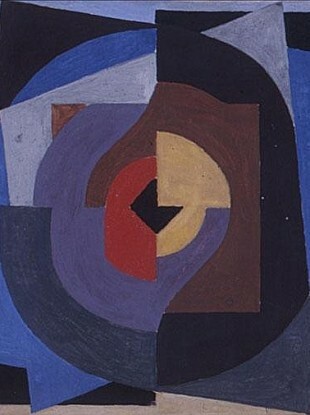 The works include two pieces by Gerda Frommel, two by Charles Brady, and three abstract pieces by Maine Jellett, one of which is pictured above. The twelve works could have been expected to fetch up to €30,000 or more, according to their guide prices. Email “Bank of Ireland to donate 12 works to IMMA”. Feedback on “Bank of Ireland to donate 12 works to IMMA”.